Anchor Systems are a must to secure Floating Turbidity Curtains around the perimeter of a marine construction work site in order to keep Turbidity Curtains in place and away from equipment. 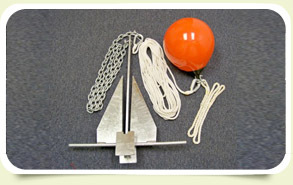 Anchor systems come assembled & complete with your choice of 25, 40 or 65 lb. 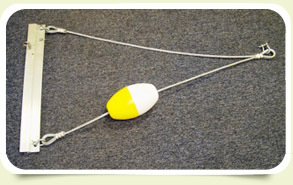 anchor and include; 8' of leader chain, 60' of line, marker buoy and tether line for attaching to Silt Curtain. Absorbents International Floating Marker Lights are used to alert anyone in the immediate vicinity up to 1 mile of the location of turbidity barriers to exercise caution while around the marine construction site. 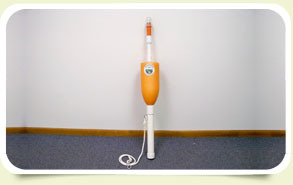 An alternative use for floating marker lights commonly used is for indicating the location of oil containment booms. Tow Bridles Are ideal for towing Floating Turbidity Curtains and Oil Boom around. A Tow Bridle distributes the towing load by transferring it to the top tension cable and/or chain. 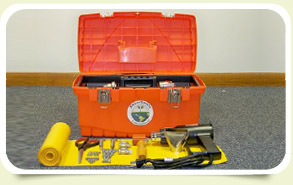 Tow Bridles are also ideal for securing Silt Curtains or oil boom to the bank of a river, pond or any body of water. Available in Small, Medium, Large and Heavy Duty.